EBC Brakes have become the largest manufacturers of disc brake pads in the world and are worldwide leaders in motorcycle road and race brakes. They have developed a range of brake pads for every aspect of motorcycle braking for Baotian Scooters and Mopeds. Baotian BT49 QT-9 Speedy (2010 to 2011) EBC front brake pads (SFA169). Available in either:- 'SFA Scooter' Series or 'HH Scooter' Sintered Series. 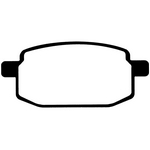 Baotian BT50 QT-11 Retro (2006 to 2011) EBC front brake pads (SFA169). Available in either:- 'SFA Scooter' Series or 'HH Scooter' Sintered Series. 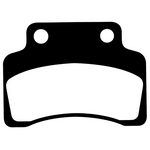 Baotian BT49 QT-12 Rebel (2006 to 2011) EBC front brake pads (SFA235). Available in :- 'SFA Scooter' Series.